Veterans in particular seemed to take offense to Trump’s misspelling. President Donald Trump misspelled “Marine Corps” on Tuesday night, instead writing “Marine Core.” Twitter quickly took notice. Trump, who deleted the misspelling and replaced it with the proper name, shared a picture of him speaking at the Marine Corps Air Station in Miramar, California. This is certainly not the first time Trump has made a typo in a tweet. 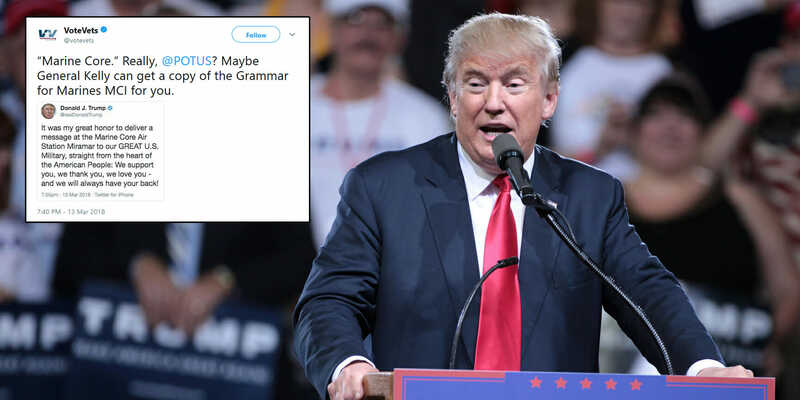 There was of course “covfefe,” a mistake that became the name of a bill, and in December 2016, the president typed “unpresidented,” a misspelling of “unprecedented” that became the genesis for a flurry of memes and jokes. But the internet took notice of the “core” mistake, bringing up his Vietnam War deferments, among other things. Veterans, in particular, appeared to take offense to Trump’s “core” mistake, as HuffPost points out. Meanwhile, Trump loves the armed forces so much, he’s thinking about putting Rick Perry in charge of vets.